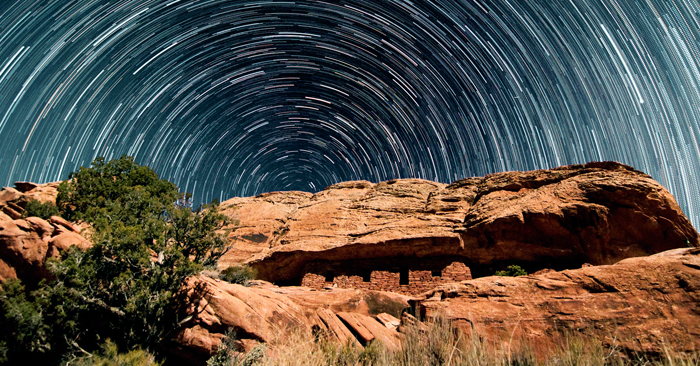 Star trails circle above Ancestral Puebloan ruins in the proposed Bears Ears National Monument, Utah, U.S. Photo by Marc Toso. Large stretches of U.S. territory that still experience natural nighttime darkness are now few in number, and they shrink every year due to encroaching development. You can help save the dark night skies over one of these remaining, vast ‘pools of darkness,’ but time is running out! Sacred to many Native American tribes, 1.9 million acres of southern Utah wilderness known as ‘Bears Ears’ contain spectacular vistas and record 10,000 years of human prehistory. Although these lands are publicly owned, their current management mandate enables various activities on the lands that, if left unchecked, will degrade the quality of its pristine nighttime environment. We urge you to contact President Barack Obama and Secretary of the Interior Sally Jewell asking them to designate these lands as the nation’s newest National Monument. The grandeur of the proposed Monument is threatened by destructive land uses, including mining, irresponsible off-road vehicle use, and looting and destruction of fragile archaeological and cultural resources. In particular, site lighting and flaring from oil and gas production around Bears Ears threatens to bring artificial sources of lighting to territory whose topography and climate have largely protected it against development. A National Monument designation will bring meaningful preservation to some of the most remote and untamed lands in the lower 48 U.S. states, recognizing their scenic, ecological, cultural, and economic importance. It will also ensure these resources continue to benefit all Americans well into the future. But the benefits of a new National Monument don’t end there. The land’s new status would immediately support the protection of Natural Bridges National Monument, A Gold-tier International Dark Sky Park completely surrounded by Bears Ears. Furthermore, it provides a buffer for the adjacent Canyonlands National Park, another Gold-tier Dark Sky Park, and Glen Canyon National Recreation, whose Dark Sky Park accreditation effort has just begun. The President has a unique opportunity in his remaining months in office to bypass the partisan gridlock of Congress and create Bears Ears National Monument by executive order. This is our best chance to bring the dark night skies of the area under permanent conservation by creating a new, protected federal status for them. IDA has offered its support to the Bears Ears Inter-Tribal Coalition and various conservation groups working to raise public awareness and support for the designation. Your voice can be heard, too! You can make a difference. Tell President Obama and Secretary Jewell today that you want them to create Bears Ears National Monument, and to protect this national treasure for generations of Americans yet to come. Read a guest post by former field biologist Stewart Aitchison on the importance of protecting Bears Ears, and learn more about the Bears Ears proposal. I respectfully request that you act swiftly and use the 1906 Antiquities Act to create Bears Ears National Monument in the southern Utah wilderness. Time is running out to create this new National Monument and we need your help! I believe that a new National Monument will protect invaluable and increasingly threatened night sky resources in southern Utah and across the Colorado Plateau. The protection of the night sky is of paramount importance to human health, ecology and ecosystems, and our tourism economy. Finally, the dollar and carbon cost of producing the energy wasted to light pollution is high. The International Dark Sky Association estimates that as much as four billion dollars’ worth of electricity is wasted each year as a consequence of lighting U.S. residential properties alone. The designation of the proposed National Monument will help protect the night sky resource in perpetuity for future generations. Previous post: Happy Centennial to the National Park Service!